A great accessory to have in the bathroom or by a dressing table, this swing-arm makeup mirror features a double arm design for easy adjustment. Design by Aptations. 7 3/4" wide frame. 13" maximum extension from the wall. Hang weight is 2 lbs. Glass only section is 7" wide x 7" high. Backplate is 5" high x 2" wide. 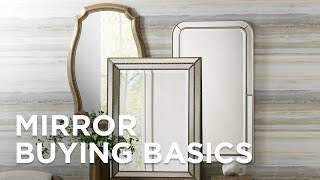 Swing arm makeup wall mirror. 5x magnification on one side. BEST ANSWER: This is a mirror. No electricity needed. How much magnification does it have? BEST ANSWER: Hi - this has 5x magnification on one side. what is the size of the back/mounting plate? BEST ANSWER: Hi Julie - The back/mounting plate is 5 inches high and 2 inches wide. Delightful beveled glass is the star of this sophisticatedmodern frameless vanity mirror perfect for a bath or dressing area. Gatco Charlotte Satin Nickel 24 1/4" x 24"
Frameless beveled glass accented with satin nickel gives this small rectangular vanity mirror its luxurious modern charm.